Quantum Leap… Are you sure you mean that? I have been meaning to write this post for a while, but for one reason or another (or rather many reasons…) I had not been able to. Right, so what has triggered this post? Well, I was having a look at a the BFI website as they usually have some very good films and event to attend and I happened to come across some news about Film Nation’s new programme on film education. You can have a look at the website here. Did you click on the link? Have you seen the title of the news item? If not, please take a look at the screenshot I include in this post. That is right! 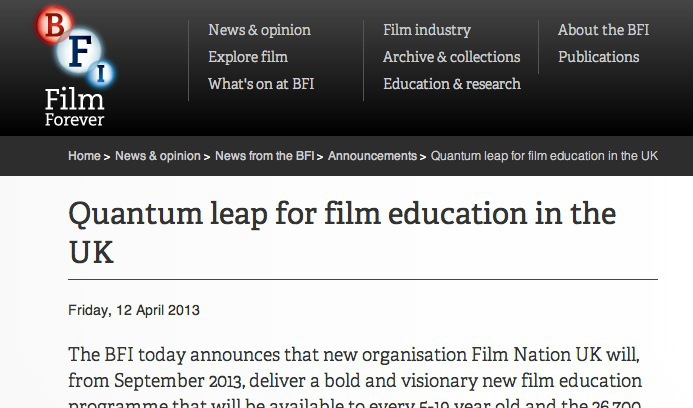 They describe the new programme as a “quantum leap for film education”. I believe they want to imply that the programme is a great advancement, but I am not sure that describing it as a “quantum leap” conveys what they want. It is rather sad to see this sort of misuses and that is why I am writing this post. So, a quantum is indeed a unit: it is the smallest amount of energy that a system can gain or lose, and this actually contradicts the message they want to communicate. The term “quantum” started being used in the early 1900s by Max Plank as part of a theory to explain the physics of the sub-atomic world. As such, light was thought as a tiny packet of energy (as well as a wave…) that could be emitted or absorbed by an electron in an atom for instance. As such a quantum leap is the smallest possible change in the energy level of that electron, and one that can take place at random. So, who knows, perhaps the BFI (as well as others out there) do mean indeed to use “quantum leap” to describe these achievement… Or what do you think? Let me know and if you have any similar terms that get misused get in touch.